Sometimes when one encounters street musicians it's a lot like "antiquing"...once in a while you can score a treasure! In Old Sacramento the street entertainment is getting better all the time. However I did not expect to find a real Delta Blues Artist like Dennis James. The most influential of the many styles of blues music, Mississippi Delta blues (also called "Delta blues") arose out of the fertile agricultural area located between Vicksburg, Mississippi to the south and Memphis, Tennessee, and bordered by the Mississippi River to the west and the Yazoo River to the east. In this region, where cotton was "King", much of the property was owned by white plantation owners and worked by black sharecroppers. Poverty was rife throughout the Delta, and working conditions were more than harsh. The guitar and the harmonica were the primary instruments of the Delta bluesman, mostly due to the ease of carrying them around, and many of the musicians of the Early Blues era (1910-1950) were sharecroppers, or worked on one of the many plantations that were located across the Mississippi Delta. You can hear the depth of their experience in no other music than you can from an authentic Delta bluesman. While the original's worked the fields and suffered the indignities that their music speaks to, Delta Blues survives today by those who have been affected and anointed with it's magic irregardless of time and space. As soon as I heard Dennis James picking his blues...I had to stop and listen. Dennis is the real deal. That's the highest compliment a bluesman can get. Blazing guitar riffs and intricate chord changes and flashy playing is not important for Delta Blues. It's all about 'blues." If you have it, you are "The Real Deal" and each bluesman will speak his own dialect of the music. Don't get me wrong...Dennis is an accomplished guitarist. 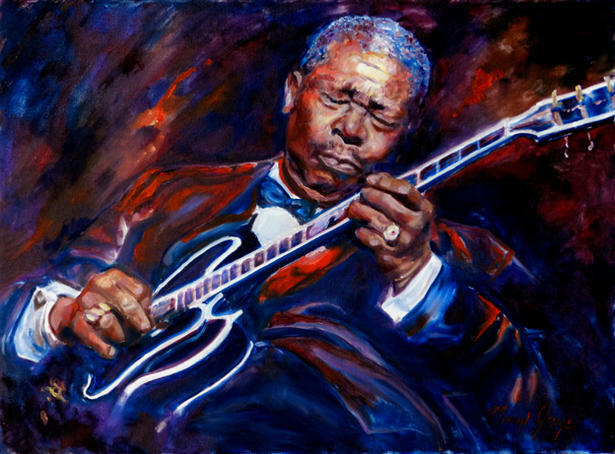 However he does not try to delute his blues with overplaying technique. The technique is feeling the blues! I felt it and joined in with my harmonica. That's my yardstick...to find authentic bluesmen. Playing along with Dennis was Carlos, another harmonica player...and we played. We played the blues...for the blues sake...not for show or money. That's what it's about. It (The Blues) has it's ups and downs in pop culture according to it's rising stars who infuse excitement into the art like Stevie Ray Vaughan did with his Texas boogie styling. Delta bluesmen usually are undiscovered talent until it's too late, except by other bluesmen who love and seek the music for it's own sake. You can find Dennis in Old Sacramento and his CD is available there for purchase....but be careful...you might fall in love with the music that started all of American music...Blues!